As we have just witnessed in Sacramento with the recent lightning storms, these warm months can still offer a wide range of weather activity - including storms with heavy rainfall that can cause ground flooding. These floods often result in water damage to homes, which may appear on the surface as a minor loss, but can quickly escalate into needless, extensive damage to both property and health. According to the restoration industry benchmark (IICRC Water Damage Standard S500), all such flooding is defined as Category 3 damage - the highest level of contamination. This includes all instances where water travels over the ground and then enters the home through basement windows or rises higher than the level of the floors. Category 3 floodwater is sometimes referred to as black water. This designation applies to water that contains unsanitary materials with the potential to cause illness in humans. Examples of black water include sewage backflows and rising water from rivers, streams, runoff, and seawater that enter a structure. First, the safety of the building occupants and all workers are the primary consideration. furniture, etc.) and any sewage, wastes, and other materials. 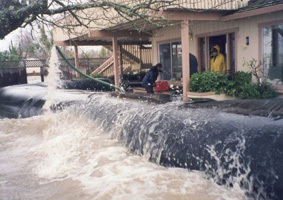 Flooding from outside the building causes a large area of direct contamination and an elevated health risk. All porous and many non-porous materials are affected by the contamination. All contaminated porous items, such as drywall, carpet and pad, upholstery, drapery, and particleboard furniture, must be removed and properly disposed. Restoration must be thorough to include removing moisture barriers such as vinyl and plastics that will conceal and retain the contamination. Cabinets and other structural enclosures must be inspected and possibly removed if contamination is present - especially if it is inside the walls behind these items. As stated, all Category 3 losses present serious risk of illness. Therefore, Contractors should ensure that all employees wear appropriate personal protective equipment. The protection needs to be extensive, which could include waterproof coveralls, face shields, and even respirators. The professional restoration company will know when to use an air scrubber to help clean the air and when to set up a Negative Air Machine to prevent contamination from spreading to unaffected areas. This is important if the flooded area is limited to a specific area of a structure, to prevent additional contamination from moving to other areas. The professional restoration company will also insure that all remaining surfaces and materials (such as structural lumber, subfloors, concrete, etc.) are cleaned and sanitized with approved cleaners and disinfectants. In some cases, structural materials are sealed to stop further contamination and to help prevent the development of mold. Following a Category 3 black water loss, a professional restoration business will know and apply the proper procedures, techniques, products, and equipment to help restore property to its pre-loss condition safely and as rapidly as possible - at the same time protecting the health and well-being of employees and others who might need to enter the area. Regardless of the circumstances - if water damage occurs from storms, floods or other sources, call your local PuroClean Home Rescue office, the "Paramedics of Property Damage." For all water damage or damage from fire or smoke, these professionals are standing by and will mitigate the loss to prevent further damage, and will then provide restoration services to return the property to a pre-loss condition as quickly as possible. All PuroClean offices have professional, well-trained and certified Technicians who provide the latest state-of-the-science services to all property damaged from water, fire/smoke, mold, and other disasters.